A Coruña is one of the two Camino Inglés starting points, but it is only 75 km (47 miles) from Santiago. 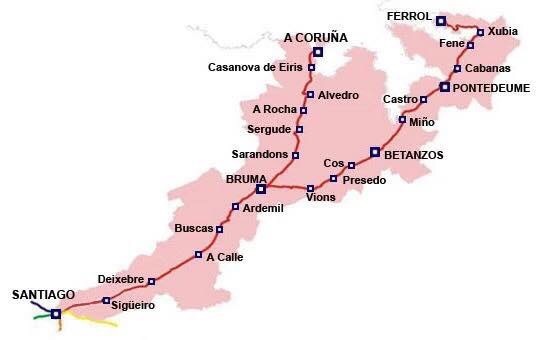 In order to get a Compostela certificate, you must walk at least 100 km, so the more popular starting point is Ferrol, 118 km (73 miles) from Santiago. I didn’t want to skip A Coruña because I had heard that it is an amazing place, so I worked it into my pre-Camino itinerary. A Coruña-Mont San Pedro. Bus to Ferrol. June 18 Home, sweet home! During my Camino, I posted some photos on a photo album Camino Inglés 2017 at Facebook.com/caminoprovides. I also shared some photos on instagram at instagram.com/caminoprovides. It was so good to be back in España! France was fun too. 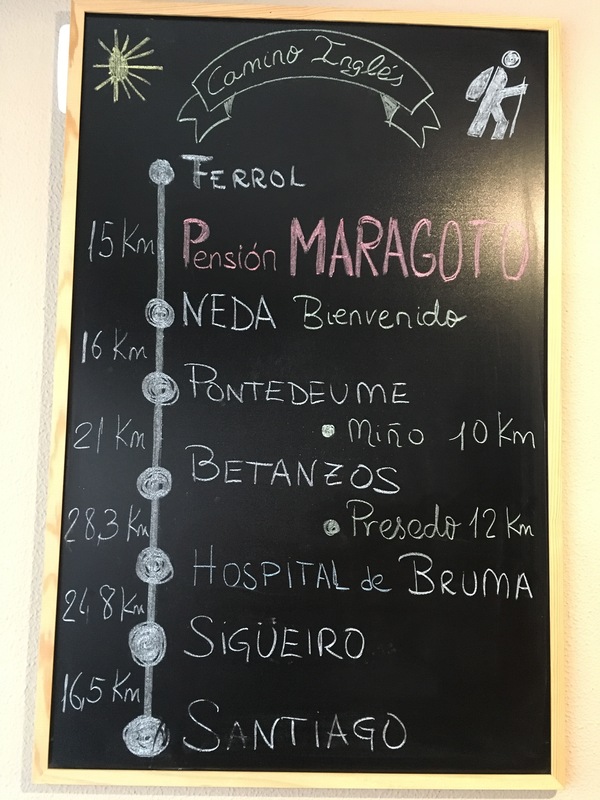 This chalkboard at the restaurant in Pension Maragoto shows the stages and half-stages of the Camino Inglés. I decided to split the longest stage between Betanzos and Bruma by staying in Presedo. This made for a comfortable paced seven-day Camino. Some people power through it in just five days. If you have eight days to walk this route, I would recommend splitting the stage between Pontedeume and Betanzos too. View from my room in Neda. I’m glad I didn’t take the shortcut bridge to Pontedeume! I walked Neda, Mino, Presedo – the restaurant there is soooo amazing! There is also a municipal albergue there – it is fine. Then the muni in Bruma, then a private in Sigueiro. Thank you. So far the albergues haven’t looked good so I’ve stayed in pensiones. Buen Camino! I suggest having breakfast before departing Pontedeume. The hill leading out of Pontedeume is steep and will require some energy. Enjoy your journey. Thank you! I am doing that stage today. Laurie, I’m enjoying your chronicle of the Camino Ingles. I tentatively plan to do it next year (perhaps as a follow on to walking another long walk in the UK). 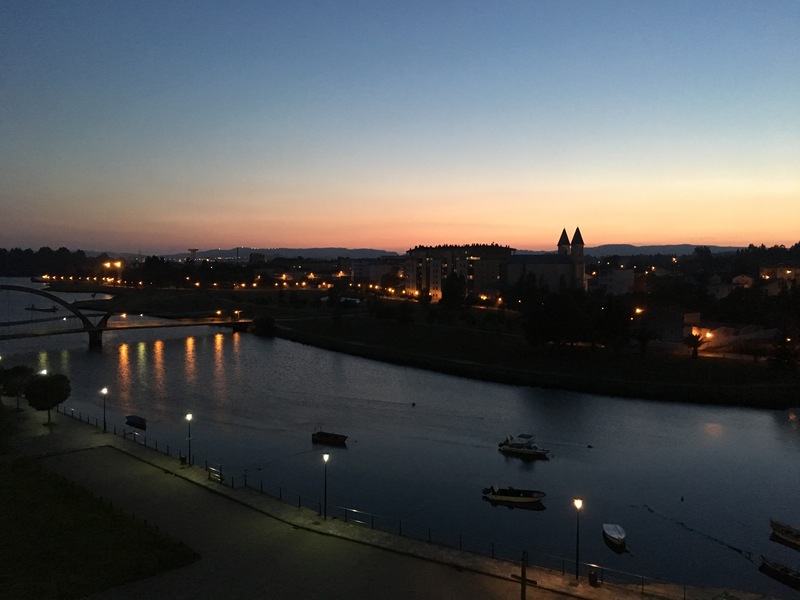 I depart for Scotland on 5 August to walk the West Highland Way, then to St. Jean to walk over the hill and down to Pamplona, and finally to Tineo to retrace my steps and complete the Camino Primitivo. Enjoy your travels and Buen Camino! Mike, aka Fog City Boy. Hi Mike, Thank you! I will probably do the Primitivo next year. I look forward to hearing about your Scotland trek and completion of the Primitivo. Buen Camino amigo! Your posts are wonderful! I always enjoy them. Love your hiking skirt! 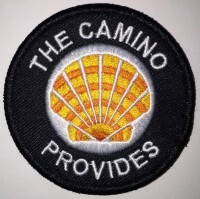 Hi Laurie, My friends and I are planning on the walking the Camino Ingles Sept. 29 to Oct. 5. Your blog is amazing. Thank you for providing helpful details. My confidence is growing because of you. Thanks Diane. If I can do it, anyone can! I have to say that the Camino Ingles is my favorite of the three I have walked so far. It’s a great one to start with for first-timers. Hi Laurie, Just wanted to let you know I did it! I walked the Camino Ingles in October. It was a huge accomplishment for me. Now I am writing a personal essay about the experience. When and if I post it, I will let you know. Congratulations Diane! Yes, I’ll please let me know when you finish your post. I’m curious to see how the route has changed. Thanks! This page is so helpful!! thank you! My husband and I leave on Oct. 8, 18! We will fly into A Coruna, then stay in Ferrol the night before starting our pilgrimage. The Ingles will be our very first Camino. We are super excited and a little nervous… but mostly excited. We have been trying to choose whether to try to walk from Ferrol to Pontedueme all in one day, or add an extra day to stop in Neda. (we also know that there is a bridge short cut … we are tempted to take that…). If we add the extra day we will have to go fly straight out of Santiago de Compostella after getting our credential and not spend a night in Santiago. So, What are your thoughts? Stay in Neda at the front, or push through and stay a night in Santiago at the end? I am so excited for you and think you picked a great route for your first Camino! This is a tough question. I wish you could spend a night in both places. You can see how much I enjoyed Neda and splitting that first stage. But staying in Santiago at least one night is essential so you can enjoy celebrating there. I think you might want to play it by ear and see how you feel when you arrive.